Leo Christopher Byrne was born in Saint Louis, Missouri in 1908. He was ordained a priest for the Archdiocese of Saint Louis in 1933, and was consecrated an auxiliary bishop for the diocese in 1954. 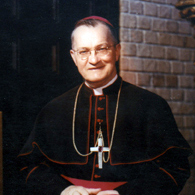 He was appointed the coadjutor Archbishop with right of succession to the Archdiocese of Saint Paul and Minneapolis by Pope Paul VI on June 13, 1967. Although Archbishop Byrne died before becoming the ordinary of the Archdiocese, his long tenure as coadjutor was marked by a considerable influence upon the people and clergy of the Archdiocese. Keenly recognizing the needs of the people, Archbishop Byrne responded generously in publicly advocating social assistance programs for lay people. This included the American Indian Movement, Urban Ministry, and other groups who worked for the poor, homeless, disadvantaged women, and even the deaf. Having a close relationship with the presbyterate, Archbishop Byrne worked to alleviate the concerns of priests. He founded the Pastoral Council, expanded the Hazelden treatment center for clergy, addressed the shortage of priests with establishing networks and more efficient deaneries, and supported the permanent diaconate. His lifelong plan of caring for retired priests was realized in a residence building dedicated for elderly and retired priests. Byrne residence hall for retired priests now stands near the Saint Paul Seminary in Saint Paul. After he was elected vice president to the National Council of Catholic Bishops in 1971, he was frequently absent from the Archdiocese. Due to the stress of the demanding work, Archbishop Byrne died of heart failure on October 21, 1974.